The EU Horizon 2020 funded project OpenGovIntelligence (OGI) project aimed to modernise Public Administration by connecting it to Civil Society through the innovative application of Linked Open Statistical Data (LOSD). OGI believes the publication of high quality public statistics can transform society, services and enterprises throughout Europe. 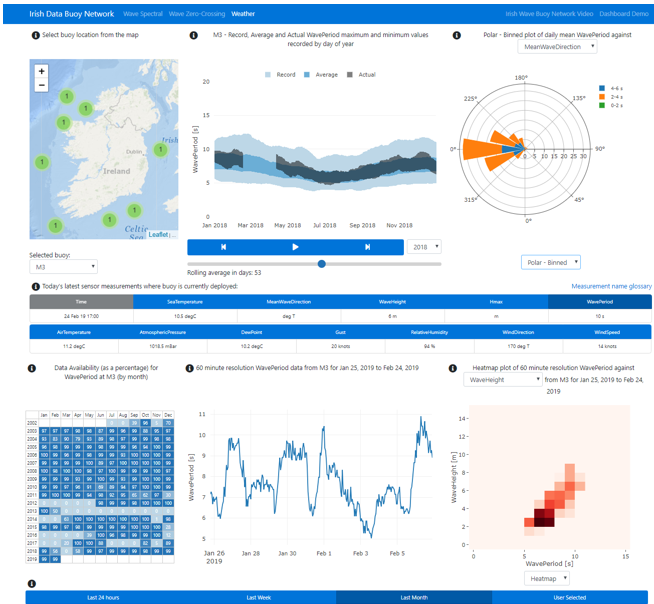 The Marine Institute pilot dashboard was developed with the objective of deriving information from environmental data. This data was collected to support the development and testing of marine renewable energy devices. The pilot is part of a wider effort aiming to develop the maritime economy in Ireland and Europe. The Marine Institute was included in the OGI project as one of 6 pilot partners from across Europe, all of which are trialling the software tools developed by the project to facilitate the generation, publication and uptake of LOSD. Ireland has two marine renewable energy device test sites: one in Galway Bay, which due to its location has conditions approximately ¼ scale of the neighbouring open Atlantic coast, and one off the coast of Belmullet in the North West, which is exposed to the full scale conditions experienced by the Atlantic. Both sites have instruments deployed to collect details of the wave conditions at the locations. In addition to these two test sites, there’s also a network of weather buoys returning environmental measurements of meteorological and wave conditions from around the Irish coasts. The dashboard developed in the OGI project provides the ability to interact with plots of data collected at each site. The plots are arranged to facilitate users deriving information from the wave buoy data set. An example of this is availability of data over time because the picture is more complex than just a start and end date due to issues with data transmission or if instruments are being serviced or replaced. A user can select from a range of visualisations to quickly determine information about the site in question (e.g. prevailing wave direction or the combination of most common wave energy period and wave height). This information makes it easier for wave energy developers who need to determine which devices might be suitable for testing. Subsequently, open access to data can be used when calculating the energy conversion efficiency of devices deployed at a site. Articles and news from the OpenGovIntelligence project, a collaborative R&D project funded by the EU Horizon 2020 programme, working on how multidimensional statistical data can help improve public services.